A new lightweight robotic arm is just one of the projects to be developed under a new collaboration between University of Auckland and Japanese research teams working on robotics and assistive devices for the elderly. For six years, MJM Sales has been representing ARI and bringing their additional expertise in product selection, training and field service to customers in the automotive market. A quantitative analysis of hummingbird wings shows that they generate lift more efficiently than the best micro-helicopter blades. The findings could lead to more powerful, bird-inspired robotic vehicles. Access to the 2014 Emerging Technologies program is available with Full Conference, Select Conference, and Exhibits Plus pass values. 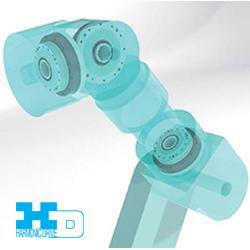 "We are honored to have our Objet30 OrthoDesk recognized by IDT magazine as a top-10 technology product"
Hurley Research LLC today announced the launch of the Droidles Project, the first ever connected network of autonomous robots that evolve together. The Social Network of Robots, Droidles is a 3-part system consisting of cute little palm-sized robots, mobile apps for remote control and simple kid-friendly programming, and an open cloud service with website. Leading industry experts partner together in Troy, MI to deliver an update on the ground-breaking improvements made to the additive manufacturing process and 3D Printing. "Neptec Technologies and Peck Tech have been working together for more than three years on adapting Neptec's Space technologies for the mining market, and now we're combining our strengths to create a unique venture to address the immediate need of our clients for innovative, machine-agnostic products and services for both open-pit and underground mining"